To say that the universe exists is silly, because it says that the universe is one of the things in the universe. So there's something wrong with questions like, "What caused the Universe to exist? 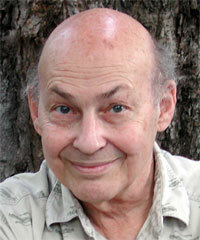 MARVIN MINSKY, mathematician and computer scientist, is considered one of the fathers of Artificial Intelligence. He is Toshiba Professor of Media Arts and Sciences at the Massachusetts Institute of Technology; cofounder of MIT's Artificial Intelligence Laboratory; and the author of eight books, including The Society of Mind. [MARVIN MINSKY:] I was listening to this group talking about universes, and it seems to me there's one possibility that's so simple that people don't discuss it. Certainly a question that occurs in all religions is, "Who created the universe, and why? And what's it for?" But something is wrong with such questions because they make extra hypotheses that don't make sense. When you say that X exists, you're saying that X is in the Universe. It's all right to say, "this glass of water exists" because that's the same as "This glass is in the Universe." But to say that the universe exists is silly, because it says that the universe is one of the things in the universe. So there's something wrong with questions like, "What caused the Universe to exist?" (1) Imagine that somewhere there is a computer that simulates a certain World, in which some simulated people evolve. Eventually, when these become smart, one of those persons asks the others, "What caused this particular World to exist, and why are we in it?" But of course that World doesn't 'really exist' because it is only a simulation. (3) But then someone else could argue that, "Perhaps there is no Computer at all. Only the Program needs to exist - because once that Program is written, then this will determine everything that will happen in that simulation. After all, once the computer and program have been described (along with some set of initial conditions) this will explain the entire World, including all its inhabitants, and everything that will happen to them. So the only real question is what is that program and who wrote it, and why"
So we have to conclude that it doesn't make sense to ask about why this world exists. However, there still remain other good questions to ask, about how this particular Universe works. For example, we know a lot about ourselves - in particular, about how we evolved - and we can see that, for this to occur, the 'program' that produced us must have certain kinds of properties. For example, there cannot be structures that evolve (that is, in the Darwinian way) unless there can be some structures that can make mutated copies of themselves; this means that some things must be stable enough to have some persistent properties. Something like molecules that last long enough, etc. Why don't we yet have good theories about what our minds are and how they work? In my view this is because we're only now beginning to have the concepts that we'll need for this. The brain is a very complex machine, far more advanced that today's computers, yet it was not until the 1950s that we began to acquire such simple ideas about (for example) memory - such as the concepts of data structures, cache memories, priority interrupt systems, and such representations of knowledge as 'semantic networks.' Computer science now has many hundreds of such concepts that were simply not available before the 1960s. Psychology itself did not much develop before the twentieth century. A few thinkers like Aristotle had good ideas about psychology, but progress thereafter was slow; it seems to me that Aristotle's suggestions in the Rhetoric were about as good as those of other thinkers until around 1870. Then came the era of Galton, Wundt, William James and Freud - and we saw the first steps toward ideas about how minds work. But still, in my view, there was little more progress until the Cybernetics of the '40s, the Artificial Intelligence of the '50s and '60s, and the Cognitive Psychology that started to grow in the '70s and 80s. Why did psychology lag so far behind so many other sciences? In the late 1930s a botanist named Jean Piaget in Switzerland started to observe the behavior of his children. In the next ten years of watching these kids grow up he wrote down hundreds of little theories about the processes going on in their brains, and wrote about 20 books, all based on observing three children carefully. Although some researchers still nitpick about his conclusions, the general structure seems to have held up, and many of the developments he described seem to happen at about the same rate and the same ages in all the cultures that have been studied. The question isn't, "Was Piaget right or wrong?" but "Why wasn't there someone like Piaget 2000 years ago?" What was it about all previous cultures that no one thought to observe children and try to figure out how they worked? It certainly was not from lack of technology: Piaget didn't need cyclotrons, but only glasses of water and pieces of candy. Perhaps psychology lagged behind because it tried to imitate the more successful sciences. For example, in the early 20th century there were many attempts to make mathematical theories about psychological subjects - notable learning and pattern recognition. But there's a problem with mathematics. It works well for Physics, I think because fundamental physics has very few laws - and the kinds of mathematics that developed in the years before computers were good at describing systems based on just a few - say, 4, 5, or 6 laws - but doesn't work well for systems based on the order of a dozen laws. The physicist like Newton and Maxwell discovered ways to account for large classes of phenomena based on three or four laws; however, with 20 assumptions, mathematical reasoning becomes impractical. The beautiful subject called Theory of Groups begins with only five assumptions - yet this leads to systems so complex that people have spent their lifetimes on them. Similarly, you can write a computer program with just a few lines of code that no one can thoroughly understand; however, at least we can run the computer to see how it behaves - and sometimes see enough then to make a good theory. However, there's more to computer science than that. Many people think of computer science as the science of what computers do, but I think of it quite differently: Computer Science is a new way collection of ways to describe and think about complicated systems. It comes with a huge library of new, useful concepts about how mental processes might work. For example, most of the ancient theories of memory envisioned knowledge like facts in a box. Later theories began to distinguish ideas about short and long-term memories, and conjectured that skills are stored in other ways. However, Computer Science suggests dozens of plausible ways to store knowledge away - as items in a database, or sets of "if-then" reaction rules, or in the forms of semantic networks (in which little fragments of information are connected by links that themselves have properties), or program-like procedural scripts, or neural networks, etc. You can store things in what are called neural networks - which are wonderful for learning certain things, but almost useless for other kinds of knowledge, because few higher-level processes can 'reflect' on what's inside a neural network. This means that the rest of the brain cannot think and reason about what it's learned - that is, what was learned in that particular way. In artificial intelligence, we have learned many tricks that make programs faster - but in the long run lead to limitations because the results neural network type learning are too 'opaque' for other programs to understand. Yet even today, most brain scientists do not seem to know, for example, about cache-memory. If you buy a computer today you'll be told that it has a big memory on its slow hard disk, but it also has a much faster memory called cache, which remembers the last few things it did in case it needs them again, so it doesn't have to go and look somewhere else for them. And modern machines each use several such schemes - but I've not heard anyone talk about the hippocampus that way. All this suggests that brain scientists have been too conservative; they've not made enough hypotheses - and therefore, most experiments have been trying to distinguish between wrong alternatives. There have been several projects that were aimed toward making some sort of "Baby Machine" that would learn and develop by itself - to eventually become intelligent. However, all such projects, so far, have only progressed to a certain point, and then became weaker or even deteriorated. One problem has been finding adequate ways to represent the knowledge that they were acquiring. Another problem was not have good schemes for what we sometimes call 'credit assignment' - that us, how do you learning things that are relevant, that are essentials rather than accidents. For example, suppose that you find a new way to handle a screwdriver so that the screw remains in line and doesn't fall out. What is it that you learn? It certainly won't suffice merely to learn the exact sequence of motions (because the spatial relations will be different next time) - so you have to learn at some higher level of representation. How do you make the right abstractions? Also, when some experiment works, and you've done ten different things in that path toward success, which of those should you remember, and how should you represent them? How do you figure out which parts of your activity were relevant? Older psychology theories used the simple idea of 'reinforcing' what you did most recently. But that doesn't seem to work so well as the problems at hand get more complex. Clearly, one has to reinforce plans and not actions - which means that good Credit-Assignment has to involve some thinking about the things that you've done. But still, no one has designed and debugged a good architecture for doing such things. We need better programming languages and architectures. I find it strange how little progress we've seen in the design of problem solving programs - or languages for describing them, or machines for implementing those designs. The first experiments to get programs to simulate human problem-solving started in the early 1950s, just before computers became available to the general public; for example, the work of Newell, Simon, and Shaw using the early machine designed by John von Neumann's group. To do this, they developed the list-processing language IPL. Around 1960, John McCarthy developed a higher-level language LISP, which made it easier to do such things; now one could write programs that could modify themselves in real time. Unfortunately, the rest of the programming community did not recognize the importance of this, so the world is now dominated by clumsy languages like Fortran, C, and their successors - which describe programs that cannot change themselves. Modern operating systems suffered the same fate, so we see the industry turning to the 35-year-old system called Unix, a fossil retrieved from the ancient past because its competitors became so filled with stuff that no one cold understand and modify them. So now we're starting over again, most likely to make the same mistakes again. What's wrong with the computing community? In the early days of artificial intelligence, we wrote programs to do things that were very advanced. One of the first such programs was able to prove theorems in Euclidean geometry. This was easy because geometry depends only upon a few assumptions: Two points determine a unique line. If there are two lines then they are either parallel or they intersect min just one place. Or, two triangles are the same in all respects if the two sides and the angle between them are equivalent. This is a wonderful subject because you're in a world where assumptions are very simple, there are only a small number of them, and you use a logic that is very clear. It's a beautiful place, and you can discover wonderful things there. However, I think that, in retrospect, it may have been a mistake to do so much work on task that were so 'advanced.' The result was that‹until today‹no one paid much attention to the kinds of problems that any child can solve. That geometry program did about as well as a superior high school student could do. Then one of our graduate students wrote a program that solved symbolic problems in integral calculus. Jim Slagle's program did this well enough to get a grade of A in MIT's first-year calculus course. (However, it could only solve symbolic problems, and not the kinds that were expressed in words. Eventually, the descendants of that program evolved to be better than any human in the world, and this led to the successful commercial mathematical assistant programs called MACSYMA and Mathematica. It's an exciting story‹but those programs could still not solve "word problems." However in the mid 1960s, graduate student Daniel Bobrow wrote a program that could solve problems like "Bill's father's uncle is twice as old as Bill's father. 2 years from now Bill's father will be three times as old as Bill. The sum of their ages is 92. Find Bill's age." Most high school students have considerable trouble with that. Bobrow's program was able to take convert those English sentences into linear equations, and then solve those equations‹but it could not do anything at all with sentences that had other kinds of meanings. We tried to improve that kind of program, but this did not lead to anything good because those programs did not know enough about how people use commonsense language. By 1980 we had thousands of programs, each good at solving some specialized problems‹but none of those program that could do the kinds of things that a typical five-year-old can do. A five-year-old can beat you in an argument if you're wrong enough and the kid is right enough. To make a long story short, we've regressed from calculus and geometry and high school algebra and so forth. Now, only in the past few years have a few researchers in AI started to work on the kinds of common sense problems that every normal child can solve. But although there are perhaps a hundred thousand people writing expert specialized programs, I've found only about a dozen people in the world who aim toward finding ways to make programs deal with the kinds of everyday, commonsense jobs of the sort that almost every child can do. I think that this is ridiculous because I don't see any basic change; therealways was too much information. Fifty years ago, if you went into any big library, you would have been overwhelmed by the amounts contained in the books therein. Furthermore, that "touch of a button" has improves things in two ways: (1) it has change the time it takes to find a book from perhaps several minutes into several seconds, and (2) in the past date usually took many minutes, or even hours, to find what you want to find inside that book—but now, a Computer can help you can search through the text, and I see this as nothing but good. As to Dyson's remarks: "Turing proved that digital computers are able to answer most ­ but not all¤ programs that can be asked in unambiguous terms." Did he? I missed that. Maybe he proved that computers could follow instructions which is neither here nor there. It is difficult to give instructions about how to learn new stuff or get what you want. Google's "allowing people with questions to find answers" is nice but irrelevant. TheEncyclopedia Britannica does that as well and no one makes claims about its intelligence or draws any conclusion whatever from it. And, Google is by no means an operating system—I can't even imagine what Dyson means by that or does he just not know what an operating system is? Can computers achieve everything the human mind can achieve? Can they, in other words, even make fruitful mistakes? That's an ingenious question. Of course, computers never make mistakes—or rather, a computer's "mistake" is a system failure, a bad chip or a bad disk or a power interruption, resulting in some flamboyant mis-step, but computers can have error-correcting software to rescue them from those. Otherwise, a computer always does the logical thing. Sometimes it's not the thing you wanted or expected, and so it feels like a mistake, but it usually turns out to be a programmer's mistake instead. It's certainly true that we are hemmed in constantly by technology. The technical wizardry in the graphic representation of reality that generated a long history of representative art is now substantially eclipsed by photography and later techniques of imaging and reproduction. Artists and other humans respond by doing more and more creatively in the zone that is still left un-competed, but if I want to know what George W. Bush looks like, I don't need to wait for a Holbein to track him down. We may reasonably expect to continue to be hemmed in. I have trouble imagining what students will know fifty years from now, when devices in their hands spare them the need to know multiplication tables or spelling or dates of the kings of England. That probably leaves us time and space for other tasks, but the sound of the gadgets chasing us is palpable. What humans will be like, accordingly, in 500 years is just beyond our imagining. So I'll ask what I think is the limit case question: can a computer be me? That is to say, could there be a mechanical device that embodied my memory, aptitudes, inclinations, concerns, and predilections so efficiently that it could replace me? Could it make my mistakes? I admit that I'm of two distinct minds on the question posed by Richard Foreman as to whether the technological explosion has led to an expansion or a flattening of our selves. In fact, a few years ago when I was invited to represent the humanities at Princeton University's celebration of the centenary of their graduate studies, I ended up writing a dialogue to express my inner bifurcation. My way of posing the question was to wonder whether the humanities, those "soul-explorations," had any future at all, given that the soul had been all but pounded out of existence, or in any case pounded into a very attenuated sort of existence. He contemplated with shuddering horror the linguistic impoverishment of our technologically abundant lives, arguing that privation of language is both an effect and a cause of privation of thought. Our vocabularies have shrunk and so have we. Our expressive styles have lost all originality and so have we. The passivity of our image-heavy forms of communication—too many pictures, not enough words, Lugubrioso cried out pointing his ink-stained finger at the popular culture—substitutes in an all-too-pleasant anodyne for the rigors of thinking itself, and our weakness for images encourages us to reduce people, too—even our very own selves—to images, which is why we are drunk on celebrity hood and feel ourselves to exist only to the extent that we exist for others. What is left but image when the self has stopped communing with itself, so that in a sad gloss on Bishop Berkeley's apothegm, our esse has becomepercipi, our essence is to be perceived? Even the torrents of words posted on "web-related locations" (the precise nature of which Lugubrioso had kept himself immaculately ignorant) are not words that are meant for permanence; they are pounded out on keyboards at the rate at which they are thought, and will vanish into oblivion just as quickly, quickness and forgetfulness being of the whole essence of the futile affair, the long slow business of matching coherence to complexity unable to keep up, left behind in the dust. When somebody questions a book, Plato complained, it just keeps repeating the same thing over and over again. It will never, never, be able to address the soul as a living breathing interlocutor can, which is why Plato, committing his thoughts to writing with grave misgivings, adopted the dialogue form, hoping to approximate something of the life of real conversation. Plato's misgivings are now laughable—nobody is laughing harder than Lugubrioso at the thought that books diminish rather than enhance the inner life—and so, too, will later generations laugh at Lugubrioso's lamentations that the cognitive enhancements brought on by computers will make of us less rather than more. Human nature doesn't change, Rosa tried to reassure Lugubrioso, backing up her claims with the latest theories of evolutionary psychology propounded by Steven Pinker et al. Human nature is inherently expansive and will use whatever tools it develops to grow outward into the world. The complexity suddenly facing us can feel overwhelming and perhaps such souls as Lugubrioso's will momentarily shrink at how much they must master in order to appropriate this complexity and make it their own. It's that shrinkage that Lugubriosos is feeling, confusing his own inadequacy to take in the new forms of knowing with the inadequacy of the forms themselves. Google doesn't kill people, Rosa admonished him. People kill people. Lugubrioso had a heart-felt response, but I'll spare you.